In 2019, by most accounts, corporate defined benefit (DB) plans are pretty well-funded. Their equity allocations benefited from the 10-year bull market, and their liabilities have come down as interest rates have risen from their post-crisis lows. Higher assets plus lower liabilities equals better funding levels. But since these favorable conditions will not last forever, the prudent next step is for plans to lock in their high funding levels. In other words, prepare now for the next downturn. The 2008 Financial Crisis devastated the pension industry, partly because many well-funded plans were too heavily weighted toward risky assets. Since the crisis, corporate plans have done a good job repairing their level of funding. The Milliman 100 Pension Funding Index, which projects the funded status of the 100 largest U.S. corporate DB plans, ended 2018 at roughly 90% funded. But 2018 also provided evidence that markets can reverse quickly. Equity markets suffered double-digit losses, and the Milliman index dropped 4.5% from its peak in September. 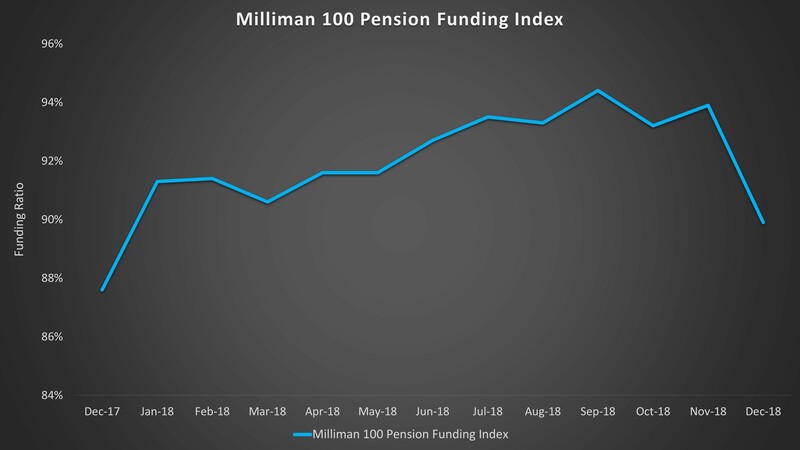 Even though most corporate pension plans lost ground in the fourth quarter, it’s important to note that the Milliman index, at 90% funded, is still 20% higher than it was in August 2010. For plans that have successfully rebuilt their funding, we recommend a shift from capital-appreciation mode to capital-preservation mode. This means reducing allocations to risk-seeking assets (such as equities) and transitioning to more liability-driven investments. Sage tailors liability-driven investment portfolios to the specific liabilities of DB plans. That means no two LDI portfolios are identical. Well-designed LDI strategies should keep duration and volatility levels in-line with their liability benchmarks and serve as effective hedges against interest rate risk. As interest rates rise or fall, LDI portfolios should minimize volatility of the plan’s funded status. For plans that choose not to hedge against market volatility, the result could be larger required contributions during the next market downturn. It is not a question of if, but when.